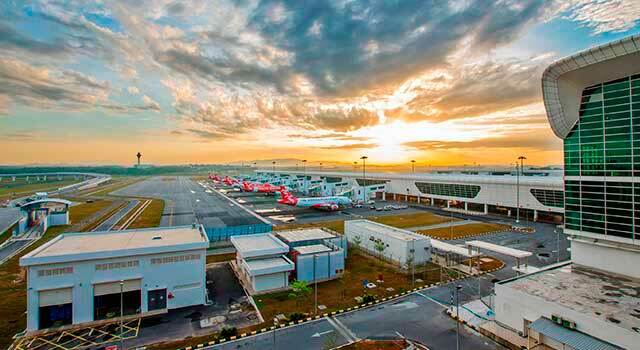 Use this website to quickly find the most important information about Kuala Lumpur Airport: Flights (Departures, Arrivals), Parking, Car Rentals, Hotels near the airport and other information about KLIA airport. 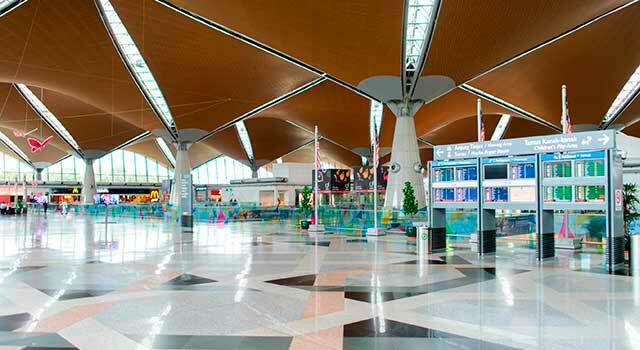 Plan your travel to Kuala Lumpur Airport with the information provided in this site. Kuala Lumpur International Airport (IATA: KUL, ICAO: WMKK), also known as KLIA, is the busiest airport in Malaysia and one of the busiests airports in South East Asia. 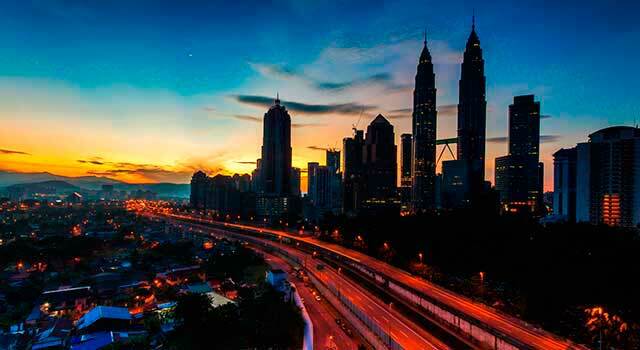 The airport is located 45 km (28 miles) south of Kuala Lumpur city centre. Kuala Lumpur airport (KUL) operates as the major hub for several airlines. Those ones are: Malaysia Airlines, AirAsia, MASkargo, Malindo Air, AirAsia X, UPS Airlines and Gading Sari. Kuala Lumpur Airport (IATA: KUL) is the busiest airport in Malaysia. 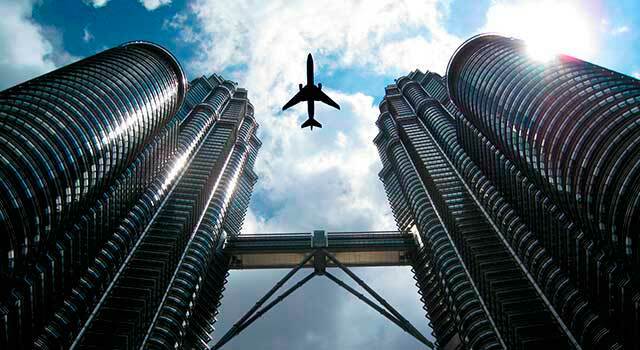 The airport is located 45 kilometres south of Kuala Lumpur city centre. KLIA served 48 Million passengers in 2014. There are two terminals in KLIA. The Main Terminal Building (MTB) is located between the two runways. The top ten busiest international countries from Kuala Lumpur airport are the following ones: Singapore, Indonesia, China, Thailand, Vietnam, Australia, Taiwan, United Arab Emirates, Bangladesh and Philipines. In 2015 KLIA airport handled 48,938,424 travelers and, also, over 726 tonnes of cargo. These figures place it as the busiest and largest airport in Malaysia and as the 23rd busiest airport in the world in terms of passenger traffic. Kuala Lumpur Airport has three Terminals: the Main Terminal Building, the Satellite Terminal and klia2 Terminal and a fourth one, the virtual terminal KL City Air Terminal. It handles domestic and regional flights and, in addition, international flights routed to other hubs within the country. It’s the domestic terminal for Malaysia Airlines. Gates are marked with: A and B (domestic flights) and G, H (international flights). Has 27 gates (letter C). 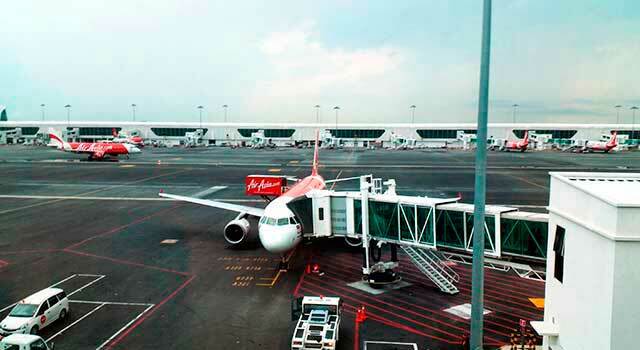 It operates with most of the international flights at KUL airport. To arrive to the terminal, passengers can pick up the Aerotrain transportation. Satellite Terminal offers many different services to all passengers as cafes, restaurants, lounges, prayers rooms, children’s areas, etc. Is the new terminal (has replaced the Low-Cost Carrier Terminal) and it’s located 2km far away from the Main Terminal Building. It has 68 gates and is the largest terminal in the world which operates with low-cost carriers. Domestic flights are lettered with J and K and gates connect directly with the Main Terminal. International flights are lettered with L, P and Q and connect with the Main Terminal via a skybridge. The terminal provides services to all travelers as shops and restaurants for all passengers. Is a virtual extension of Kuala Lumpur airport and it’s located in KL Sentral, the main railway station. Provides check-in services to Cathay Pacific, Etihad Airways, Emirates Airlines, Royal Brunei Airlines and Malaysia Airline although it’s planned to expand the service to other airlines. Kuala Lumpur airport has a lot of different services to provide to all passengers the best experience during its travel. Some of those services are: hotels, lounges, children’s area, prayer rooms, restaurants, cafes, shops, massage, etc. - Aerotrain: An automated people mover that connects between the Main Terminal and the Satellite building of the KUL airport (2-3 minutes). It runs at 55 km/h and departs every 3-5 minutes. There’s also a connection between the Main Terminal Building of the airport and klia2. - Bus: From Kuala Lumpur airport there are some public and private buses options to go or come back to the airport. Take a look in the transportation page to get more information. - Rail: KL Airport is connected with KL Sentral transportation hub with the city centre by Express Rail Link (ERL). From the airport there are two ERL stations: Main Terminal - KLIA station and Gateway@klia2 - klia2 station. To get more information, visit the transportation page. - Taxis and Limos: from the airport operate 4 different types of taxis: Budget taxi, Family Service, Premier Limo and Super Luxury. Taxis and Limos operate through a coupon system that you can purchase at: International Arrival Hall; Domestic Arrival Hall and in the Domestic Baggage Reclaim (Arrival Level). links with klia2 Terminal. The transport hub at Gateway@klia2 connects klia2 to KLIA Ekspres, with allotted pick-up and drop-off areas for coaches, taxis, car rentals and private transportation. Items Lost at Airport Terminal: Level 2, Main Terminal Building, KLIA. Phones: +60 (3) 8776 3733 / +60 (3) 8776 3742. After 5pm, weekends or public holidays, please, call: +60 (3) 8776 2000. For items lost in an aircraft, please, contact with your airline.